The term Meningioma is a name for a tumor, arising from cells that form the covering of the Brain. The covering layer is called "meninges". The vast majority of these tumors are benign. Meningiomas are generally well defined, discrete lesions, in sizes that vary from a few millimeters, to many centimeters in diameter. Symptoms are caused by compression of Brain or Spinal Cord. Meningiomas account for approximately 15% of all intracranial tumors. They commonly occur in the fourth through sixth decades of life. Meningiomas are a little more common in females and are rare in children (only 1.5% of all Meningiomas occur in childhood). Ninety (90 %) percent of Meningiomas are intracranial while ten (10 %) percent occur within the Spinal Canal, most of which are in thorax portion of the Spinal Column. Radiation therapy to the Brain and/or Spinal Cord/Canal, for some other disease process, has been implicated in subsequent Meningioma formation, especially in children. While trauma is unusual as a cause, there are cases of Meningiomas forming under a fracture, occurring in an area of scarred Dura Mater, or around a foreign body. Patients with von Recklinghausen's Disease also known as Neurofibromatosis and NF2 tend to develop multiple Meningiomas at a young age. In these cases chromosomal aberrations are regularly seen. Hormonal factors may play a role in the genesis of Meningiomas; both estrogen and progesterone receptors have been found in cases of Meningioma. The clinical symptoms and signs of Meningiomas are related to those of an intracranial mass lesion, or seizure. Meningiomas have variable neurological signs and symptoms, depending on their size, degree of Brain swelling that they incite and location within the nervous system. These tumors have a predilection for certain regions within the nervous system which, as a result, produces symptoms and signs specific to the tumor's location. It is common for the clinical course of a Meningioma to span a period of years. The Brain is "compressible" in a way similar to a sponge as long as the growth of the tumor is slowly progressive. Nevertheless, there is a "limit" to which Brain matter can be compressed and once that limit is reached the Brain's ability to accommodate to the "mass" is diminished resulting in the development of Neurological Deficits and or Seizures. It is at this point that the Brain's characteristic response to injury also begins to occur - the development of Brain Swelling (Edema), which results in an even greater "mass" compressing normal Brain. This is the beginning a fateful cycle which may well threaten the patient's neurological integrity and life. CT scanning (done with and without "contrast agent") can be a definitive diagnostic method since it may show the tumor as a homogeneously contrast - enhancing mass with well defined borders. MRI scanning usually accurately identifies the presence of a Meningioma when used with "contrast" enhancement (an agent known as "Gadolinium"). MRI can superbly demonstrate the Meningioma and its relationship to adjacent neural and vascular structures. Finally, catheter angiography is used in some cases, when it is necessary to demonstrate the tumor's vascularity and its blood supply. This may be important in some cases of very vascular tumors where pre-operative embolization, to obstruct the tumor's blood supply, is done to facilitate surgical removal. More than 70% of Convexity Meningiomas (tumors occurring over the top surface of the Brain) are in the Frontal region. If located in this region, they may remain asymptomatic, while growing to a very large size. Epilepsy and focal neurological signs are common. These Meningiomas are among those with an excellent potential for total removal. These Meningiomas arise in association with the Superior Sagittal Sinus (a major draining vein structure of the Brain) and are located in the midline. They often cause Focal Epilepsy, and later, Paralysis, especially of the lower extremities. Tumors arising from the Falx (the rigid midline membrane lying between the Left and Right Cerebral Hemispheres) are located in the midline and often extend to both sides of the Brain. These tumors, while presenting some technical challenges, are very amenable to complete resection. Figure 1A (Left): MRI Scan (Gadolinium Enhanced Sagittal View) of a Parasagittal Meningioma located in the Posterior Frontal/Parietal Region and arising from the Falx. Figure 1B (Right): MRI Scan (Gadolinium enhanced Coronal View) of the Posterior Frontal/Parietal Region Parasagittal Meningioma. Its relationship to the Falx (the vertically oriented structure) is well demonstrated (Arrow). Olfactory Groove Meningiomas (See Figures 8, 9 & 10 below) arise from the Cribriform Plate which lies under the Frontal Lobe at the base of the anterior portion of the Skull. This tumor can grow bilaterally and may become large without causing significant neurological deficits, or evidence of increased intracranial pressure. Loss of smell can often be the only symptom. Changes in mental status are not apparent, until the tumor has reached a large size. Visual impairment and/or blindness can occur once the tumor becomes large and impinges on the Optic nerves and chiasm. These Meningiomas, which also involve the Skull Base, lie underneath the Frontal Lobes of the Brain after arising from the Planum Sphenoidale, Tuberculum Sellae or the Diaphragma Sellae. These anatomical structures span a short area at the Base of the Skull beneath the Frontal Lobes. Tumors in these locations characteristically cause early visual failure which typically involves loss of visual acuity and progressive and asymmetric visual field deficit. Rarely is visual loss sudden. Figure 2A (Top): MRI Scan, Serial Sections (Sagittal View) Tuberculum Sellae Meningioma in a 46 year old male with Left Visual impairment. The tumor has extended to involve the Pituitary Fossa (Sella Turcica). 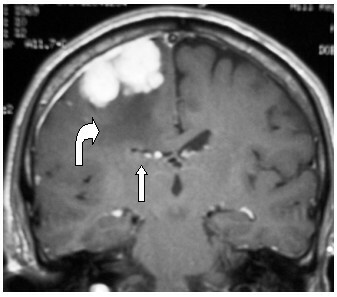 The Arrow in the CENTER IMAGE is positioned in the Sphenoid Sinus and directed upwards towards the tumor within the Sella. The Arrows in the LEFT & RIGHT IMAGES point towards the Tuberculum Sellae portion of the BONE of the SKULL BASE which lies just above the Sella Turcica. 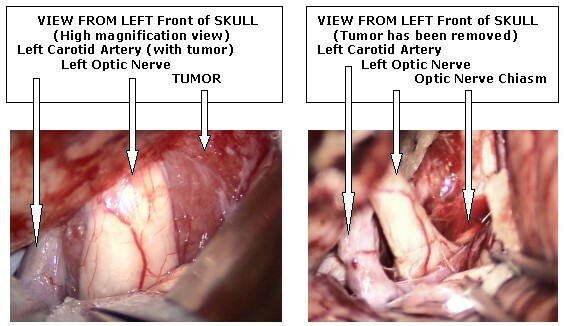 Figure 3A (Left): Operative Photo-Same patient as Figures 2A&B - The tumor partially encircles both the Left Optic Nerve and the Carotid Artery. The nerve is compressed from below and is displaced superiorly. Figure 3B (Right): Operative Photo. The tumor has been completely removed. The Left Carotid Artery, Left Optic Nerve and Chiasm are well seen. The Right Optic Nerve is further to the right of the far right arrow. Meningiomas of the Sphenoid Ridge (a skull bone structure) are traditionally divided into three types: outer, middle, and inner Sphenoid Ridge tumors. The Outer (or Lateral) Sphenoid Ridge Meningiomas are usually accompanied by Epilepsy, focal weakness, and trouble with language function, when present on the left side. The tumors of the Inner (or Medial) Sphenoid Ridge usually compress the Optic Nerve and present with early unilateral visual loss. They also may involve the Cavernous Sinus to cause double vision and numbness of the face. Figure 4A (Left): MRI Scan (Coronal View) Right Lateral Third Sphenoid Ridge Meningioma with surrounding swelling causing considerable Brain compression and shift of midline structures. Figure 4B (Right): MRI Scan (same patient) Transaxial View of the Large Right Lateral Third sphenoid Ridge Meningioma. 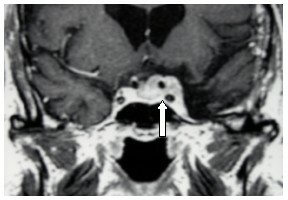 Figure 5: MRI Scan (Coronal View) Medial (Inner) Third Left Sphenoid Meningioma with invasion of the Pituitary fossa and the Left Cavernous Sinus to surround the Left Carotid Artery (Arrow). These constitute about 10% of all Meningiomas. The neurological findings in these tumors can be a combination of Posterior Cranial Fossa and supratentorial symptoms. These can be headache, speech disturbance, visual changes, nausea/vomiting, and balance difficulties. These tumors can also cause extensive cranial nerve findings, including facial weakness, hearing loss, swallowing difficulty, and facial numbness. Depending on the specific location of the tumor they may cause weakness and spasticity. Some of these symptoms may mimic the usual symptoms seen with Acoustic Neuromas, Epidermoid Tumors or Arachnoid Cysts. 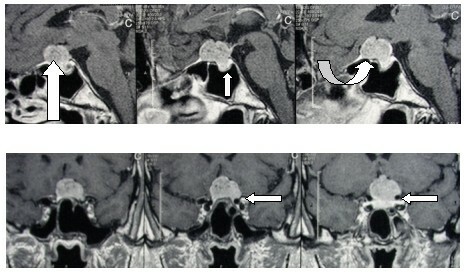 Figure 6A (Left): MRI Scan (Transaxial View) Right Cerebellar Pontine Angle Meningioma (Arrow) compresses the Brain Stem adjacent to the Right Internal Auditory Canal (IAC). This is different from an Acoustic Neuroma which would originate inside the IAC. Figure 6B (Right): MRI Scan (Coronal View) Right Cerebellar Angle Meningioma compresses the Brain Stem (Arrow). Compare the degree of compression as shown in figure 6A. Figure 7A (Top Left): MRI Scan (Sagittal View) Posterior Cranial Fossa Tentorial Meningioma. This Meningioma involves the vital venous structures of the Skull, the Superior Sagittal Sinus at the Torcula Herophili. Figure 7C (Left): MRI Scan (Axial View) Torcula Herophili Meningioma (Arrow) involving the region of the junction of the Superior Sagittal Sinus and the Transverse Sinuses. Meningiomas can also occur in some unusual locations such as the "interior" of the Brain. The "ventricles" are "cavities" within the Brain associated with the production and "flow" of the vitally important Cerebrospinal Fluid (CSF). CSF is actually produced through an "active" biological process in anatomical structures known as "Choroid Plexus" that reside inside these Ventricles. Choroid Plexus structures are located in each Lateral Ventricle as well as in the Third and Fourth Ventricles. Meningiomas can arise from cells of the Choroid Plexus. By virtue of their unfortunate location, these tumors can cause an obstruction to the critical CSF pathways resulting in a progressive increase size of the ventricles, a condition called "Hydrocephalus". Hydrocephalus is a potentially life-threatening complication since the Intracranial Pressure can increase to critical levels as the pressure within the Ventricles rises. In addition the progressive increase in Ventricular size produces relentless pressure on the Brain from the inside (similar to blowing up a child's balloon). This causes progressive neurological deterioration. Surgical management of this condition is mandatory and challenging. The treatment options include observation, surgery and radiation. "Observation" of small tumors in older patients that do not cause symptoms is an option since these tumors are benign and are slow growing. They may not cause any problems during the life span of some patients and can be followed with yearly MRI scans. Surgical removal is the best treatment option in young patients, in patients where the tumor is in a critical location, in patients where these tumors cause significant symptoms such as behavior alteration, personality change, weakness, paralysis or seizures and/or is acting as a major "mass" lesion (as in Figures 1A & B and 4A & B). Figure 8A (Above): MRI Scan (Gadolinium Enhanced Coronal View) ANTERIOR Skull Base Meningioma (Arrows) in a 70 year old lady. 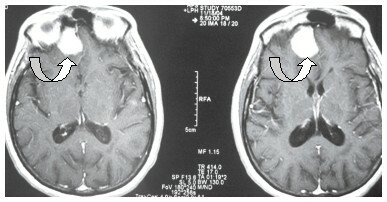 Figure 8B (Left): MRI Scan (Gadolinium Enhanced Transaxial View) Meningioma (Arrow) Note: Same patient as Figures 8A, 9 & 10. Figure 9A (Left): OR Photo Dr. Lazar performing a Minimally Invasive Endoscopic Directed Image Guided removal of the Anterior Skull Base Tumor using a "KEY-HOLE SURGERY" Craniotomy approach through an "eyebrow" incision. Figure 9B (Right): Post-operative CT Scan demonstrates the small "Key-Hole" Craniotomy. 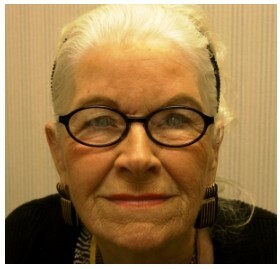 Figure 10: 1 Month post-operative photograph of the 70 year old lady represented in Figures 8 A&B and 9 A&B. This patient was discharged from hospital on the 2nd post-operative day. Note: The early post-operative scar at the right nasal bridge. Although the majority of Meningiomas "grow" fairly slowly and compress the adjacent Brain tissue, there is a "limit" to the Brain's ability to accommodate to that compression. Once that "limit" has been exceeded the Brain's characteristic reaction is to "swell". The swelling (Cerebral Edema) is a pathological response at a cellular level. As the swelling progresses, it causes additional compression of the surrounding Brain which, in turn, results in decreased blood supply to the affected region of the Brain. This decreased blood supply leads to more injury ("ischemia" or "lack of blood supply"); more injury leads to more swelling; more swelling; more pressure; more pressure; decreased blood supply; decreased blood supply; more injury and so on, as a vicious cycle. It becomes imperative to control this Brain swelling since its progression can lead to severe neurological deficit and eventually to death. Unfortunately, the Brain swelling associated with a Meningioma is somewhat different from that occurring with other Brain tumors such as metastatic tumors. In the latter, the edema reacts fairly rapidly and reliably to high dose steroids. The Brain swelling that accompanies a Meningioma can be much more difficult to control. 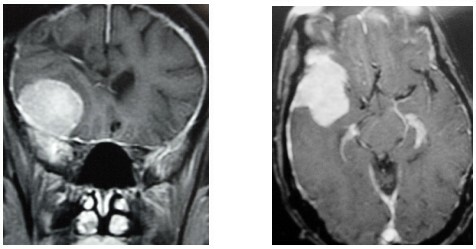 Figure 11(Left): MRI Scan (Coronal View) Right High Convexity Posterior Frontal Meningioma in a 68 year old Male. The Right lateral Ventricle is compressed (Vertical Arrow) as a result of the combined effect of the "mass" of the Tumor and the edema. 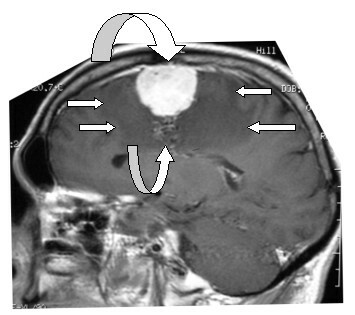 Figure 12: MRI Scan (Gadolinium Enhanced Sagittal View) Right High Convexity Posterior Frontal Meningioma (Down-curved Arrow) in the Same Patient as Figure 11. 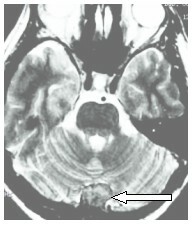 The extent of the Brain swelling (Dark Grey area surrounding the tumor-indicated by the Horizontal Arrows) is quite substantial. A "complex" of veins (Up-curved Arrow) draining Blood from the tumor is deeply situated within the substance of the Brain. Radiation therapy is an option for some patients with recurrent Skull Base tumors, in patients who are considered to be very poor risks for surgery or in the very unusual case of a tumor that is in an area where surgery is very likely to produce disastrous consequences. Radiation is best given as Stereotactic Radiosurgery. Hormonal therapy with anti-estrogen agents is a possible alternative. Meningiomas are well known to have "receptors" for Estrogen as well as Progesterone. They have a propensity to increase in size during pregnancy. The possibility to reverse the rate of growth or decrease the size of tumors remains an attractive concept; however, this therapy has not achieved any degree of reliability. The long term results and effects of these agents remain to be determined. Perhaps more importantly, women who are either receiving "replacement hormone" therapy (as is often required after hysterectomy) or who are using birth control medication that incorporates these hormones, should consider using only the LOWEST DOSE medication that their physician recommends and stopping the use of this form of birth control. Meningiomas are known to recur. Many factors relate to recurrence, the most important of which, is the extent of the original removal. Complete resection, including removal of the dural margin, is associated with a low rate of recurrence. Of course, Meningiomas that are more aggressive (or the rare Metastatic Meningiomas) and/or have spread ("En Plaque") along the Dura which it also infiltrates are associated with an increased rate of recurrence based on the biology of their cellular components.